In Yosemite National Park there are many lakes, including some with large sandy beaches, and various places along the Merced River, Tuolumne River or creeks that tempt people to swim in the usually cold water. 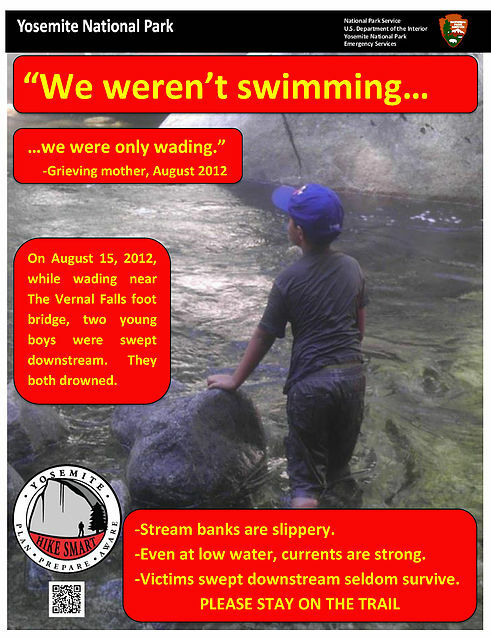 See below for a few recommended swimming holes. 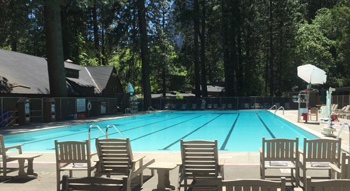 There are also two heated swimming pools at hotels in Yosemite Valley, free for guests of the hotel and open to the public (for a fee). The safest places to swim are the hotel pools with lifeguards, usually open Memorial Day to Labor Day. THUNDER STORMS are an issue for swimmers in swimming pools and in lakes, rivers. . . Most of the time pools stay open in the rain, but lifeguards know to close a pool at the first sound of thunder, and not let people back in to swim until a half hour after the last thunder. People swimming at beaches/in lakes should follow the same safety rule. Wise people don’t swim when thunderstorm clouds are building up. The Park Service warns: “Drenching thunderstorms can form in a matter of hours . . . storms often bring intense rain, hail, and lightning strikes, particularly in mid to late afternoon (but can occur at any time).” With the wind storms can bring, you could be quite cold on your walk back from that swimming hole, so rain gear and warm layers could be wise even on a warm summer day. Check out the size (16 inches?) of the trout nibbling at his Teva! If you choose to swim in a lake, creek or river, please note that without a lifeguard, and with cold, sometimes swift water you are taking more risks. The pressure of water against your lower legs as you wade may make it feel like a slow current, but if your whole body is pushed against a rock by that same current you can find yourself submerged and stuck against that rock. You should keep your children within arms reach at a swimming pool or while in/near a river/creek/lake. Many recreation center swimming pools offer lifejackets for children to wear. Wise parents should bring a properly fitting child sized lifejacket for when children play in the lakes/rivers/creeks. If you or your kids don’t swim well, look for a shallow inlet safely separate from the main river for a water play area. If your family does swim well, watch other people at a ‘swimming hole’ before you go in. Notice where the current is faster, or where the current tries to bring people under overhanging or partially submerged tree branches, abandoned cables, or narrow gaps between rocks. Notice where the water is too deep, how cold it is and set boundaries for your kids’ use accordingly. The best way to check an area out for safety is to watch others first, then get in and wade/swim yourself. You can do all this without making a scene and embarrassing your teenagers. Stay awake and in very close proximity of your kids who are playing or swimming (within arms reach to the little ones). Again, have the weak swimmers wear their lifejackets. If you have the little ones wear their lifejacket while swimming, remember, these aids don’t guarantee safety! Kids who wear these get overconfident and swim out too far. Stay in arms reach of them and keep them in shallow water with no current. 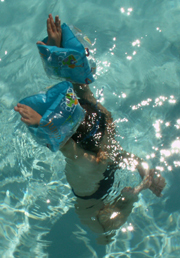 Waterwings are not recommended, even at a swimming pool, as they have been known to creep up or quickly slip up to wrists and leave the child with their face held underwater with not enough strength to get their face to the surface to breathe. It’s not safe to enter the river/lakes head first or hand first in a dive anywhere. And it is ILLEGAL TO JUMP OR DIVE OFF BRIDGES. Another reason to discourage your group from jumping is that they are role models for others. They might be good enough at jumping to not slip or accidentally lean backwards and hit their tailbone or the back of their head on the bridge as they jump, but a child who sees them and tries it might not be. And if one of the group is not sure about it and is being pushed (literally or not) to jump, they might start to jump and their brain will re-consider/panic and they might hesitate in mid-jump, not jump out and away from the bridge, again causing them to impact part of their body on the bridge. Parents have been cited and paid fines for encouraging their under-age children to illegally jump off bridges. There are times you should not enter the river, such as before rafting is allowed, or when you see big illuminated signs on the road into the park saying the RIVER IS CLOSED. THERE ARE PLACES YOU SHOULD NEVER SWIM, posted with warning signs, including Hetch Hetchy reservoir. 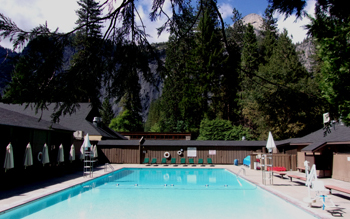 or at the pool at the base of Lower Yosemite fall. People have also suffered grave injuries when they slipped on slick rocks in or out of the water. Please do not ignore warning signs. Stay on designated trails/ bridges / walkways. If there is a sign that says DO NOT SWIM . . . don’t swim OR wade OR put your feet in the water to cool off. In the first picture below, (taken when the river was closed to rafting and any other water activities) it looks like this section of beach along the river is shallow enough for a play area for little kids. But in the second picture, taken from across the river, you can see white water. If the kids got in and got a little excited about fun, they could go too far out in the water quite quickly, and be swept down river with no way to save them. 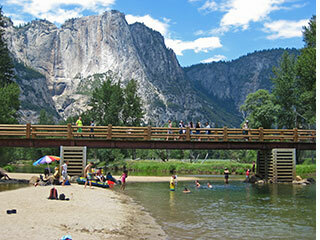 Here are a few of the favorite swimming areas in Yosemite. Help protect the river by entering and exiting the water only on sandy beaches, not through/on plants. You don’t have to climb over huge boulders to get to any of the following recommended swimming holes. At Tuolumne Meadows, the world’s greatest swimming hole has a small waterfall that cascades into a pool that is deep enough for swimming, and also shallow enough for wading/sitting. 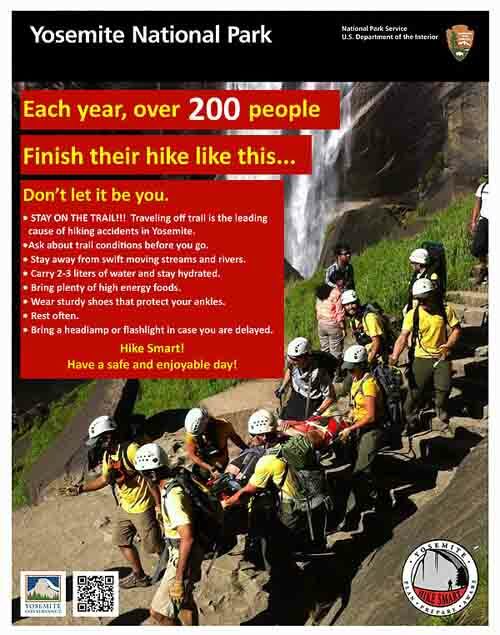 M-a-n-y people have been seriously injured at the base of lower Yosemite Falls, please stay on the trail/bridges/walkways and wade/swim someplace safer. Housekeeping Camp , free shuttle bus stop # 12, has a huge wide sandy beach and narrower ones along the river. 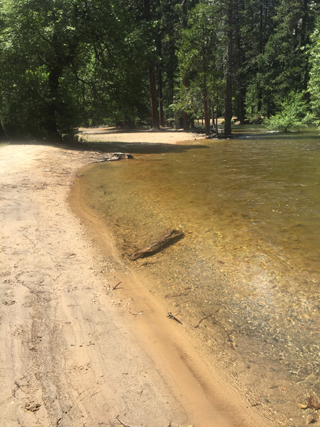 A short walk from free shuttle bus stop 7 is Swinging Bridge (nope, the bridge does not really ‘swing’ anymore) and a good swimming area (in season) with shallow and deep water, sandy beaches and Yosemite Falls views. In spring and even early summer, when swimming seems like it would be fun, the river can be dangerously fast and the walk from the lodge to this swim area can have moving water along the walkway, thus reminding people it would not be safe to swim! Across the bridge is a large picnic area with tables, grills and accessible vault toilets. 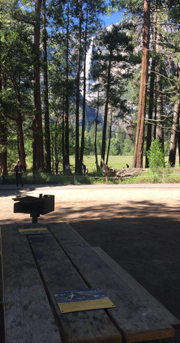 Some of the tables have views through the trees of Yosemite falls. Head towards the river from free shuttle bus stop 7, along a parking lot road and down a path alongside Leidig meadow. Along with her parents and seven-year-old sister, the six-year-old subject was wading in a shallow area of the river, just below Swinging Bridge. The subject’s parents don’t know how it happened, but all of a sudden they saw the subject slipping below the water in what turned out to be a deep section of the river; the last they saw of their daughter was one of her hands reaching skyward before it disappeared. The mother and then the father, both fully clothed, jumped into the water at the spot they last saw their daughter. Neither parent knows how to swim, so they also sank to the bottom of the river. A bystander, watching what had just happened, jumped off the bridge into the river, and with one arm grabbed the six-year-old subject, while with the other arm he pushed the father, who in turn pushed against the mother, up and out of the water. Other bystanders helped the parents out of the water, while the original bystander carried the subject out of the water. The subject never lost consciousness and reported to clinic staff that she remembered the entire episode. The parents estimate she was submerged under the water for 1-2 minutes. After she was rescued, the subject was coughing persistently, but was able to breathe on her own. About an hour after the near-drowning episode, the subject complained of a stomach ache and vomited multiple times; her parents brought her to the clinic for further evaluation. 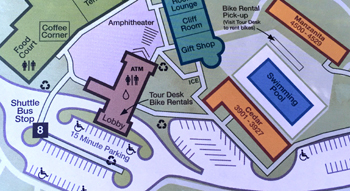 After consulting with Children’s Hospital Central California, the clinicians at the Yosemite Medical Clinic advised the subject’s parents to have her transported by ambulance to Children’s Hospital for more extensive evaluation and overnight observation. Submersion injuries can present in a variety of ways. The victim can be completely unresponsive and pulseless or can be awake and oriented and seemingly unscathed. It is worth noting that even subjects without any symptoms that suffer near drowning can still decompensate into respiratory failure up to 8 hours after the injury. It is therefore essential that all near-drowning victims receive further medical assessment. 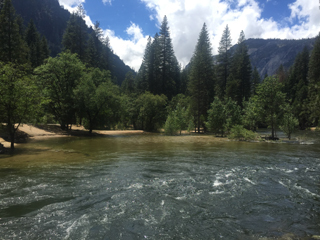 It is imperative for those playing in and near water in Yosemite to understand that drowning incidents occur not only in fast moving white water, but also in shallow, slow, seemingly benign bodies of water as well. This is particularly true for young children and those who do not know how to swim. According to the Centers for Disease Control (CDC), every day in the United States, ten people die from unintentional drowning. Of these ten, two are aged 14 and younger. 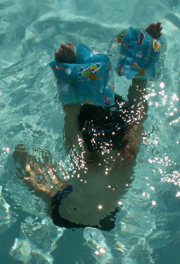 Children ages 1 to 4 have the highest drowning rates. Research has shown that both lack of swimming ability and lack of close supervision influence drowning risk. 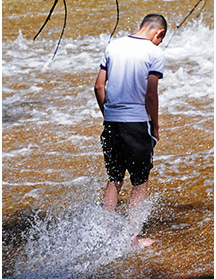 One drowning prevention strategy that is particularly important in Yosemite is close supervision of children when they are in and around rivers and lakes. The CDC recommends that “because drowning occurs quickly and quietly, adults should not be involved in any other distracting activity…while supervising children…” It is worth noting that the adult responsible for the supervision of the child should be comfortable and capable of swimming him or herself. The supervisors of young children should provide “touch supervision,” close enough to touch or reach the child at all times. Michael Miranda-Ruiz, 22, and friends were walking and playing in shallow eddy water in the Delaware River near Kittatinny Campground in Minisink, New York, around 8 p.m. on July 23rd. As they moved along, they wandered into the deeper main current. Members of the group began to panic and struggled to get to the shoreline. Bystanders helped them, but noticed that Miranda-Ruiz was missing. They called for help via 911, and rangers and local rescue units responded. Miranda-Ruiz’s body was recovered around 9:40 p.m. by divers. Miranda-Ruiz was a non-swimmer and was not wearing a life jacket. 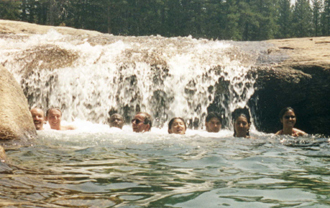 None of the members of the group had ever been swimming in a river. Rangers and state police are investigating. 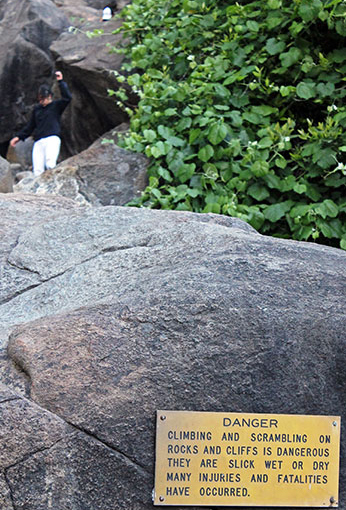 The park warns: “Drownings are the number one cause of accidental death in the National Park Service and at Yosemite National Park. 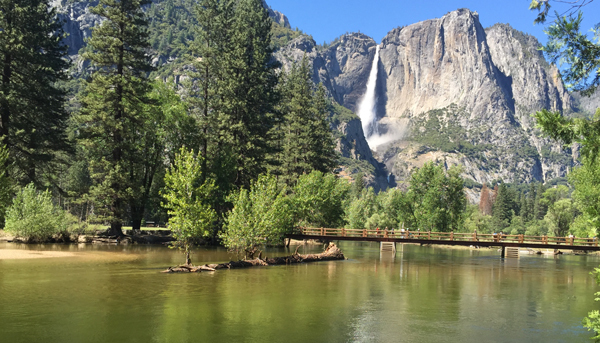 Most Yosemite drowning victims were not swimming or boating but accidentally slipped into the water. Yosemite’s swift water is more powerful than any swimmer and streams are full of dangerous entrapments. A brief dip in the Emerald Pool became a near-death experience for two 18-year-old swimmers on July 17, 2016. 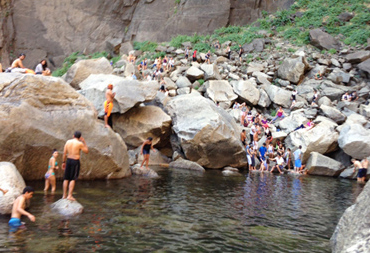 A group of eight older teens were hiking the Mist Trail above Vernal Fall. Two of the teens, both from Southern California, were familiar with swimming and recreating in the Pacific surf. They reached Emerald Pool as late-afternoon shadows were falling across the canyon. The strong current and cold water thoroughly exhausted both young men. One was surviving the return swim but the other literally was not. The surviving swimmer doubled back to rescue his friend but fatigue overcame both swimmers. Their six companions on shore, though watching in horror, were not able to help. At this point, the young men were now losing their battle against drowning. During their struggle, an anonymous Good Samaritan entered the water and grabbed the more distressed swimmer just as he was bobbing under the water. The rescuer pulled him to the water’s edge, enabling the other swimmer to self-rescue. The Good Samaritan, whose identity remains a mystery, left the scene. The distressed swimmer swallowed water and, although on dry land, was vomiting and barely responsive, even as the first emergency medical responders arrived. His condition was serious enough that a Yosemite Search and Rescue (YOSAR) team had to carry him down to Happy Isles on a litter. It appears both swimmers will make a healthy recovery. Emerald Pool is not a swimming pool. Other swimmers have drowned after discovering the challenge of cold and current when it was too late. Warning signs are a good indication of a tragic history. 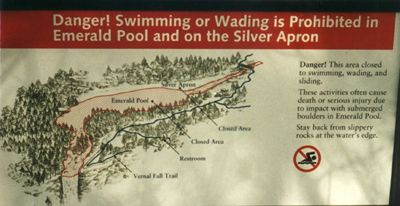 Emerald Pool and the adjoining Silver Apron are well signed with warnings about and prohibitions against entering the water in this area. In hindsight, the rescue went well and achieved an ideal outcome. However, entering the water to aid a distressed swimmer is not encouraged because these would-be rescuers often require rescue themselves, or die. This almost became a case in point when the first rescue attempt turned into a losing battle against exhaustion. The recommend rescue technique is to try to get a floatable object to the struggling swimmer(s) and immediately alert authorities. 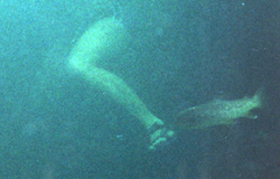 Yosemite’s waters present unique dangers often quite different than the oceans’ hazards. Familiarity with the ocean does not translate well into success in Yosemite’s waters. Although swimming is a necessary skill around any water, sometimes even strong swimmers lose their lives in Yosemite’s waters, including at Emerald Pool.